On our way to Ginza, Dan had researched a Japanese wrestling store near the Tokyo Dome he wanted to check out. I walked in with him and despite it being a fascinating shop, thought my time was better spent wandering the grounds of the then, empty Tokyo Dome. 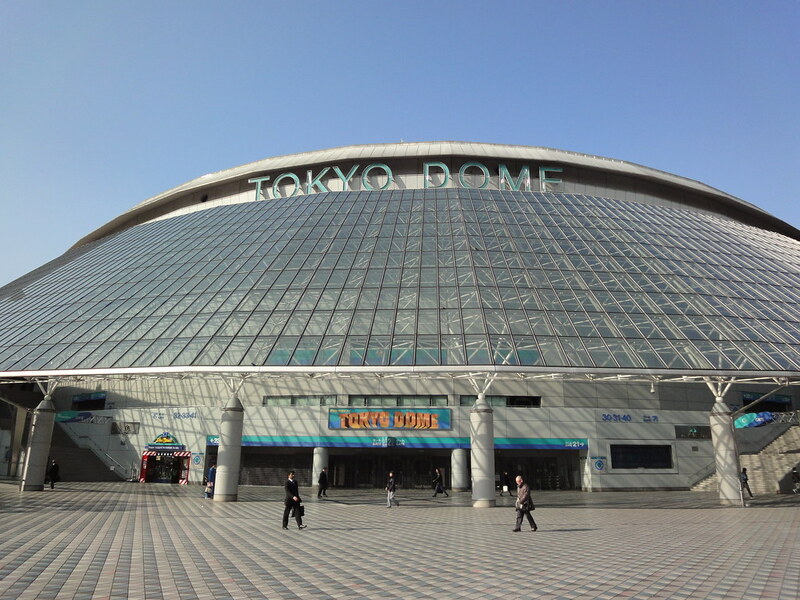 Tokyo Dome is a stadium in Tokyo; Japan built in 1985 and the home field of the Yomiuri Giants baseball team. The Giants hadn't made it into the playoffs this year, so the stadium was mostly empty despite for a few storefronts still open selling Giants merchandise. In addition to baseball, the stadium also hosts concerts, American football, pro-wrestlings and mixed martial arts. Dan had hoped to catch a wrestling event here, but alas, all the tickets were sold out, and since we couldn't buy them online, he was pretty disappointed to have to miss out on such a great experience. I spent the rest of my time waiting for Dan sitting outside on the sidewalk since there weren't any benches around. Don't make this sound depressing, so many people gave me a look as it to say "Are you ok?" but I was having a ball! I loved watching people come and go from the metro entrance, chatting on the street and just enjoying their evening. People watching is definitely one of the best things to do on vacation. After Dan had finished up in the store, we headed off into Ginza. 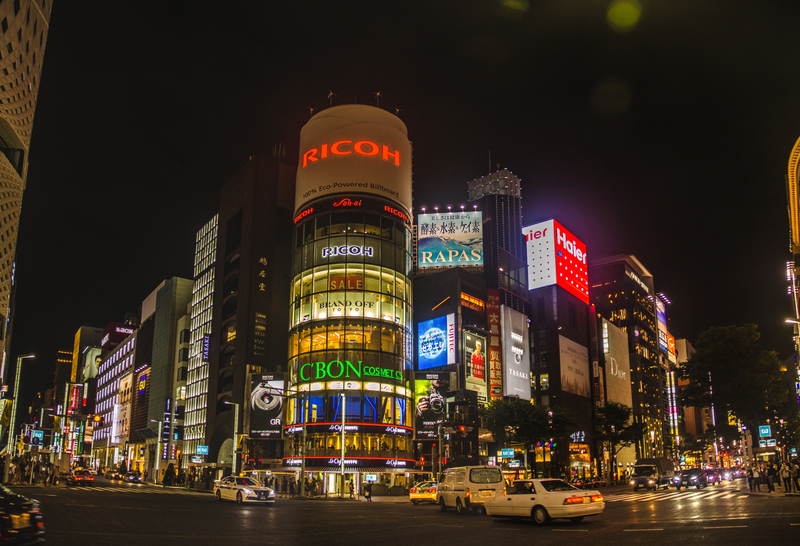 Ginza is a district of Chūō, in Toky. 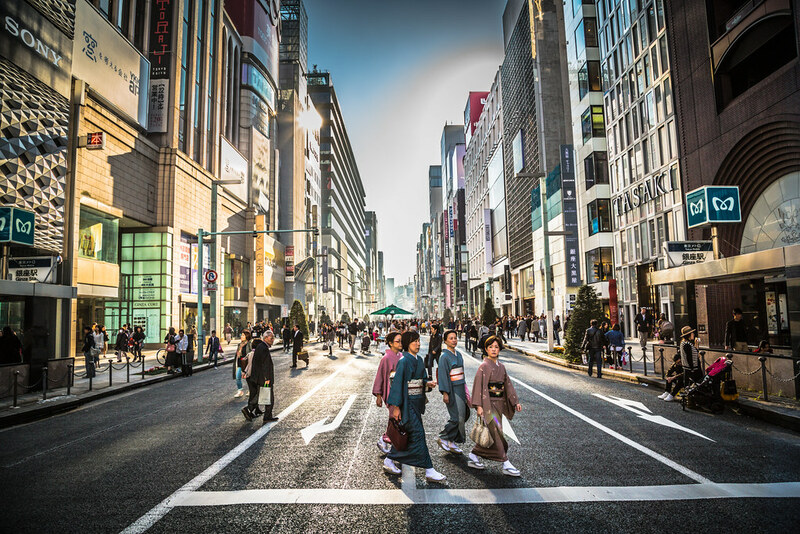 Ginza is the Rodeo Drive of Tokyo, filled with upscale shopping malls featuring luxury boutiques and brands. 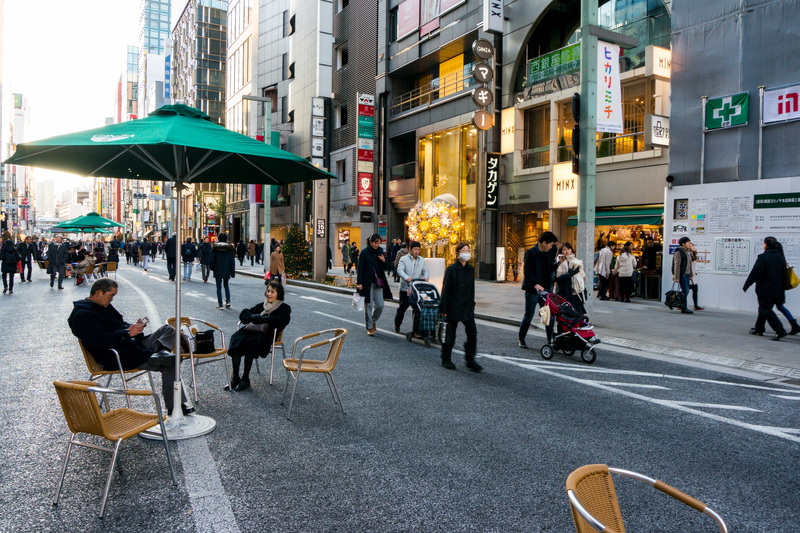 On the main street, Chuo Dori, if you find yourself there from 12 pm to 6 pm April to September, they close the road down and turn it into a pedestrian walking zone. This is the best time to visit since it allows you to wander along a much larger stretch of road and get the bet views of the sprawling towers and fantastic architectural designs. 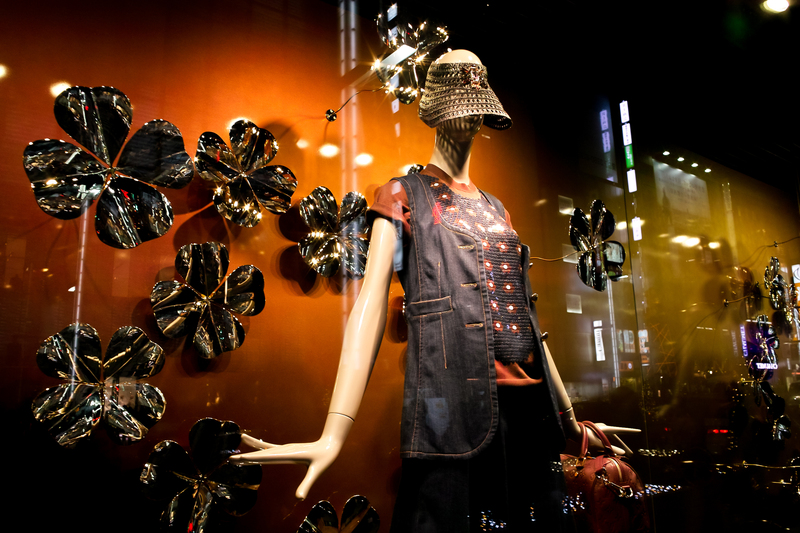 As night falls in Ginza, the shop fronts seem to adapt and change. Certain parts of the architecture light up, creating new and exciting shapes against the evening sky. It's worth coming here towards the end of the day to experience both the day and nighttime views of these fantastical stores. The interior decoration of the windows was also spectacle and unlike anything I'd seen before. Not even in New York or LA can see spectacles like they make in Japan. 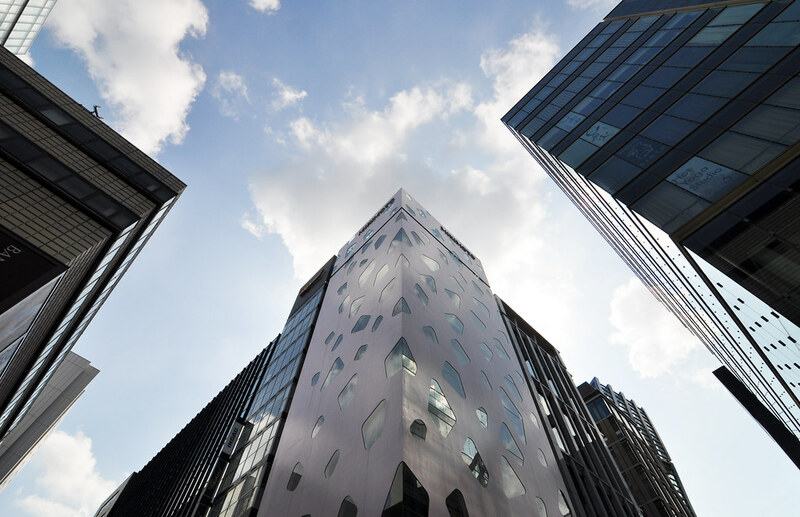 One of the most interesting buildings in Ginza is the Mikimoto Boutique, known for it's irregular windows that glow at night. Mikimoto is known to have invented the cultured pearl in the 19th century. And now the shop sells luxury and casual jewellery to tourists and locals alike. Bulgari is another building worth stopping outside of if only to get a look at the enormous necklace that is wrapped around the tower, made up of lights. 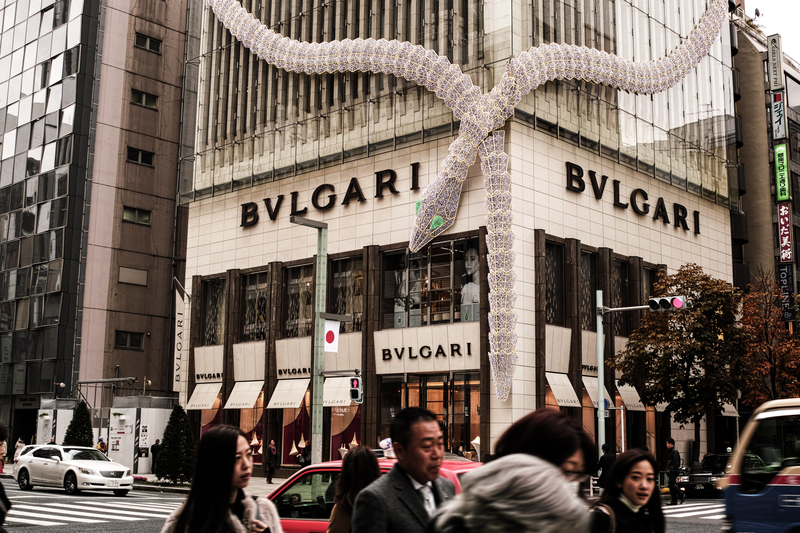 The ends of the iconic Bulgari necklace are shaped like the heads of snakes, and their eyes glow in the darkness. The one store, I made a point to stop inside was Tokyu Hands. Despite being in Ginza, this is a not a high end, luxury store. Tokyu Hands is department store with urban "do-it-yourself" merchandise. You can find tiles, towels and textiles! It's over 11 stories tall, but the main area I stuck to was the stationary floor. 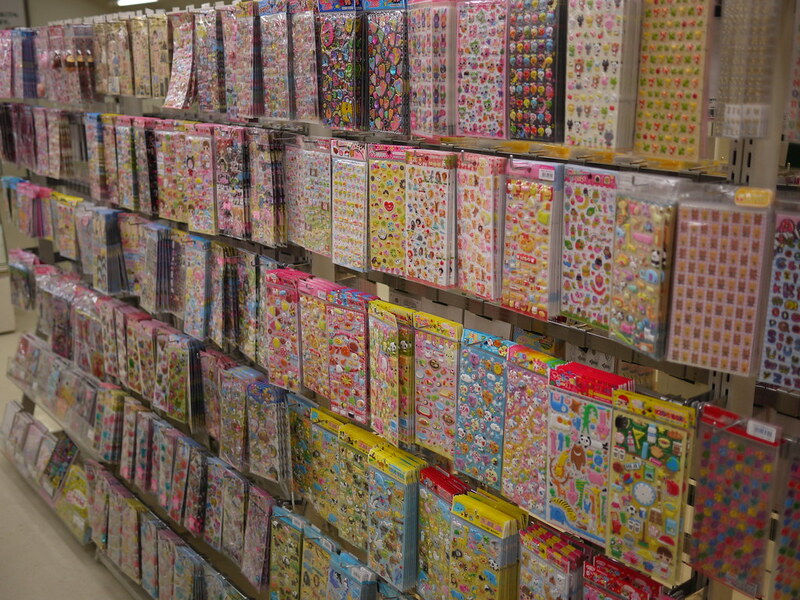 There were dozens of racks of stickers, notebooks and hundreds of coloured pens. I filled a cart with unique stickers and a Twin Star notebooks, a nostalgic call back to my childhood, and called it a night. Dan's bag filled with wrestling mementoes and mine with bright paper hearts.